The month following the discovery of Ceci's cysts, resulted in me unearthing many new things about myself as well. For example, I learned that ugly crying in the car was kind of my thing. I would drive home from work, park in the drive way for approximately fifteen minutes and bawl my eyes out. My ugly cry was so ugly, it put Kim Kardashian's to shame. The deep rooted Catholic in me also resurfaced for the first time since my First Communion in 1991. I was praying to anyone and everyone...God, Saint Gianna (the patron saint of unborn children,) Saint Jude (the patron saint of lost causes.) Let's be real, if anyone at that time was a lost cause it was me. And I discovered that I had a slight Google addiction. If I wasn't ugly crying or praying, I was "Googling" anything and everything that related to cysts. In fact, I decided at one point, that all exam rooms should have a computer. After the doctor gives you news...good or bad...all patients should be allowed ten minutes to "Google" the most outlandish, the most dramatic, and the most fear provoking WebMD, Wikipedia, CDC articles they can find. The doctor should then spend the next ten minutes fielding questions, which I would imagine would be many. The day of the Level II ultrasound, I sat silently next to my husband as he drove us to the hospital. I remember walking into the exam room, a small notebook clutched tightly next to my body. Scrawled across its pages were numerous questions...the results of my Google addiction. The tech smiled at me when I showed them to her. Each time the tech took a picture, I asked a new question. Rocker bottom feet? No. Clenched hands? No. VSD? No. ASD? No. We went on like this for an hour. Picture. Question. Answer. Picture. Question. Answer. 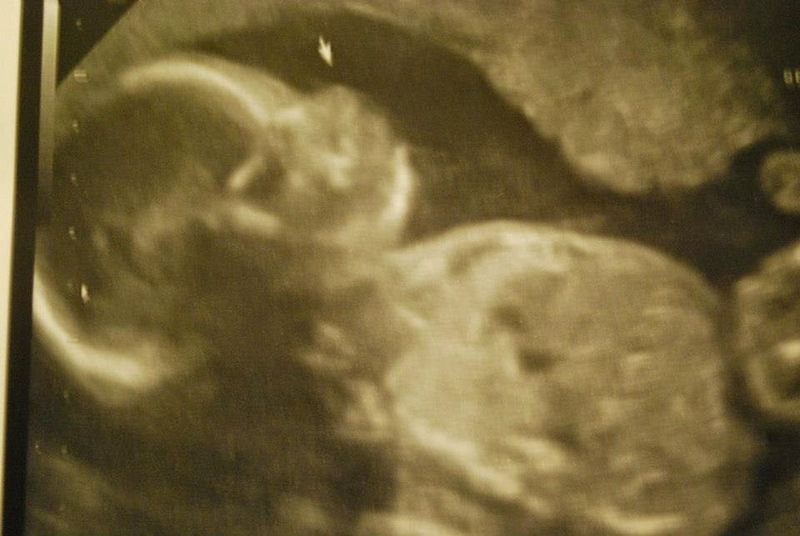 A picture from our Level II ultrasound. Look at that sweet profile! The doctor came in. She said the ultrasound looked good. She stressed that it was just a screen and not a diagnostic tool. I told her that I understood. We talked about the possibility of Trisomy 18 and Trisomy 21. Words like "amniocentesis" and "termination" lingered in the air, while numbers like 1 in 861 and 1 in 5,000 and 1 in 500 buzzed around me. Then, the tech and the doctor walked towards the door. They told me to take my time. To discuss it with my husband. That the choice was mine. I do not care how much time they could have or would have given me, it would have never been enough. I needed more than time. I needed an ugly cry in my car, a few prayers, and a Google session. Chrystal thank you so much for your sweet words! If you start blogging, I would love of you would send me a link to your blog so I can follow. Much love and best wishes! Love you and your honest exposure of some often times painful experiences. Very raw, yet very real.